This kind of tactic I find repugnant because yes I am an American president Obama and I don`t agree with this tactic or the Democratic stance on this issue. The Republicans wouldn`t have to resort to this kind of negotiation if Democrats could ever be forced to cut any type of spending in any other manner. The Democrats just refuse to admit that there is a problem that is at the critical stage, and it needs to be addressed now, even if the country has to go into a recession to finally address the spending problem. The numbers just don`t add up anymore, and this is our Jesus Moment where we are AIG and we realize we need to sell a bunch of these credit default swaps while we still can because if the market turns against our debt portfolio even slightly in relative terms, the debt burden will take down our entire country. We saw what happened to AIG, well there is nobody to bail out the United States. This is the last chance before interest rates and the bond vigilantes awaken from their slumber and debt markets revert back to their historical norms, and then we are AIG and it is too late. The Democrats are the “Bad Guys” here! I will frame the debate in the other direction. Democrats are irresponsible, and the Republicans already raised taxes and revenue, now this is your turn to address spending. If you refuse to address spending in the next month where you have had 5 years to cut spending and have refused then you are the irresponsible party, dead wrong on this issue, and you are the bad guys. I don`t care if you won the election with a 100% mandate, I am sure the Greek politicians won all their damn elections as well. So stop spouting this campaign rhetoric as it is irrelevant to the spending problem at hand. We don`t have a tax problem, we have a spending problem. We never have a problem raising taxes in this country, but we sure have a problem cutting wasteful spending. Personally, I doubt that the country`s spending issues and debt constraints that will hit home 5 years down the line were really on the voter`s minds while casting votes in the recent election. It is never on voter`s minds until you get Greece style austerity programs, then it really becomes on their minds, and guess what the Greek citizens still didn`t want to cut spending even when their country was in default. So relying on the voters to volunteer to cut back spending is like asking a fox guarding a henhouse to tighten up security measures. It isn’t exactly in the majority of the population’s interests since the majority benefit from all this spending in the short term. This isn`t a Republican or a Democrat issue as President Bush sure was quite a spender during his 8 years in office as well, and he wasn`t very fiscally responsible, and I don`t consider him a good president from a long term fiscal thinking standpoint. So I am just as hard on the Republicans on this issue as the Democrats, and they need to do a much better job cutting back on Military spending which has been in “Overkill” mode for the last 10 years. The Republican Party has positioned themselves as budget hawks, but they have their own set of skeletons in the closet with regard to excessive Military spending over the years that has contributed their fair share to the federal debt of 16 trillion dollars and counting. Yes the United States needs a military to meet any threats posed by our enemies, but the amount that we currently spend versus the actual threats is just a waste of money. I know that the industrial military complex as it were provided jobs in areas of technology and research and development not to mention an entire supply chain of components along the manufacturing process for military weapons and logistical infrastructure. But the problem is that net of taxes generated for the nation versus costs to tax payers, military spending doesn`t pay for itself, and is a net drag on the economy from an economic standpoint. I know there are all kinds of areas where this country needs to cut spending but Republicans can make the first move by offering up some legitimate cutbacks in military spending to get the ball rolling in the negotiations because the democrats are going to have to cut their “untouchables” as well. I frankly think that both sides are naïve in regards to just how much legitimate cutting on spending they are going to have to do as the numbers they are discussing are not even close to what is required. And with Obama already pushing the idea of closing corporate loopholes in the tax code, he and the democrats are still focused on the revenue side of the equation, even after just winning on the revenue issue this past month. I guess they still want more revenue, but I hope this is just an opening negotiation stance, but if we are still negotiating over revenue issues in the debt ceiling debate, then this country will be in default in 10 years instead of fifteen. This is not a political debate, this is a financial decision, get rid of the politicians and bring in the accountants and risk managers. The politicians have had their chance to solve the debt problem, now it is time to bring in the number crunchers and let them decide objectively where to cut government spending. This is now a business decision like AIG, and I am your risk manager Mr. President tapping you on the shoulder telling you it is time to cut spending. Just like a proper risk manager needed to tap the derivatives group at AIG, and say you are overexposed here sell this percentage of the portfolio of credit default swaps throughout the remainder of the next two months. I am your accountant Mr. President, and I know you are proud of how many votes you just won an election by over the Republicans. Congratulations are in order, now Mr. President the numbers don`t add up, and you just raised taxes, so now you have to cut spending by this amount or we declare bankruptcy in fifteen years. Do you understand this Mr. President? Do you follow what I have laid out here? Our option is spending cuts or bankruptcy, sure Mr. President we can raise taxes some more, but it is only a stop gap measure. The only real way to solve the escalating budget debt problem with the country`s future debt obligations is to cut spending by a massive amount Mr. President. Yes I know you will be out of office when the country defaults, but is this what a responsible president would do? Are you a responsible Individual? As your risk manager cutting spending is the responsible way to begin solving this problem Mr. President. In fact, it is the only way or we default on our debt obligations in fifteen years. Republicans: Right on this issue! Now we need to stop campaigning there are no more elections for you to win, the Republicans may indeed be bad guys, but on this issue they are actually good guys. I don`t even care if they are addressing the issue because of purely selfish reasons. I don`t care why, but I am your risk manager, and you need to cut spending it is the only course of action that is a viable option after just raising taxes. Remember, the only reason the republicans have had to resort to these type of tactics if that the democrats will literally never address spending cuts. The United States will be in default a la Greece, and they still wouldn`t enact austerity programs. They just cannot stomach spending cuts even if the country has to default, they literally don’t seem to care. This is how much this party lives by spending. The Democrats are the habitual spender who maxes out all the credit cards, and keeps on shopping till they are literally all declined. That is the only way they will ever cut spending. The Democratic Party needs some counseling on spending. They need to take one of those debt management courses, and have their finances managed by a third party via a court appointed process. Even when the president is trying to frame republicans as bad people, he still can`t even help but show his true colors and the party’s true colors by dropping little hints that they are not serious about addressing any legitimate spending cuts. Sometimes Mr. President, one has to do the unpopular thing, if it is in the best interests of the country. This is the AIG moment, get your act together, and lead. This is your AIG or Greek moment and you’re failing miserably, and going to go down as the President who sent the country into unsustainable default territory a la Greece. 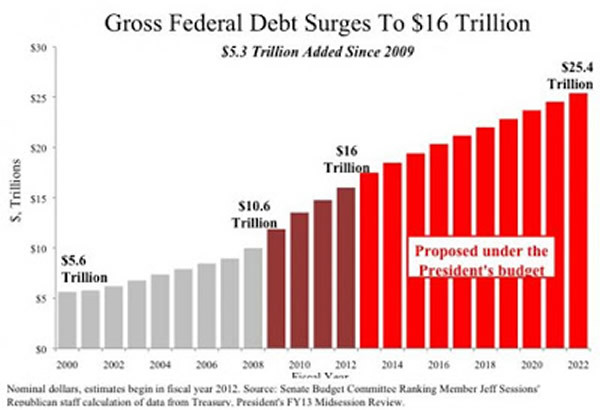 This is where we are headed right now, and you will get blamed for this lack of fiscal discipline, regardless of how much President Bush spent on Defense Spending because this is what your tenure is being defined as the “Spending President”. Now is the time, to get serious from both sides of the aisle, and this means cutting wasteful military spending! But just because the Republicans need to cut defense spending, doesn`t mean you are off the hook Democrats. We are going to need much more significant cuts to the budget than either side is proposing currently as the numbers even with aggressive spending cuts being talked about today, are just not going to solve the problem. They are too small, relative to future obligations even under this low interest rate environment. Just today the Social Security Administration reported that by 2033 they will run out of money, enough is enough you are the president of the United States; you are not there to do the popular thing, but the right thing. I am sure that Greece politicians were elected by the majority as well, and they had prescription drug plans that the country couldn`t afford. Guess what, they really couldn`t afford them, and a bunch of other governmental obligations that the country just couldn`t afford. We are on the same path as Greece, and you need to recognize that being a true leader is not doing the popular thing but the right thing with regard to fiscal responsibility. Not spending within your means is the irresponsible act here, not balancing the budget is the irresponsible act here, continuing down the same path as Greece is the irresponsible act, and not addressing spending cuts in the next month is the irresponsible act. I am not asking you to cut spending, Mr. President, as your Risk manager I am telling you to cut spending now as the only viable option in solving this government debt to GDP issue. That is the problem with risk manager`s, when the problem goes all the way to the highest levels of power within a corporation, i.e., AIG, Greece, and MF Global, nobody ever listens to the risk manager. The position never carries enough power when mismanagement is at the highest levels of government or business.